Laparoscopic adrenalectomy was initially performed, in 1991, for a case of adrenal hematoma (1). Gagner et al. first reported the procedure for neoplasia in October 1992 (2); however, Go et al. had begun a series of laparoscopic adrenalectomies in patients with primary aldosteronism in January 1992 (3), followed by Suzuki et al., who had also commenced a series in February the same year (4). No randomized controlled trials have been undertaken to compare laparoscopic adrenalectomy with traditional open surgery. However, on the basis of comparative studies, laparoscopic adrenalectomy has demonstrated superiority in terms of analgesic requirements, recovery, convalescence, length of stay, and cosmesis, whilst maintaining equivalent long-term operative efficacy (5-8). Laparoscopic approaches to the adrenal gland may be performed via either transperitoneal or retroperitoneal routes and may be either unilateral or bilateral. Initially, the transperitoneal route was used, predominantly because of the familiarity of this approach with open surgery (9,10). 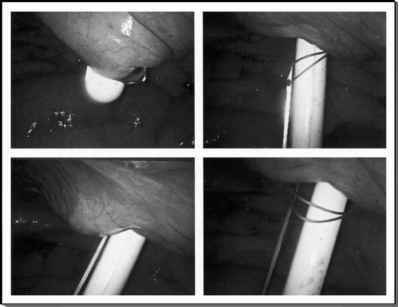 However, following the development of retroperitoneal techniques by Gaur in 1992, lateral and posterior retroperitoneal approaches have also been adopted (11). Further modifications have since been developed including the transthoracic approach (12), the supragastric approach for left-sided lesions (13,14), hand-assisted laparoscopic adrenalectomy (15), the use of needlescopic instruments (16,17), and, most recently, robotic laparoscopic adrenalectomy (18-20). This chapter will describe the authors' preferred approach of transperitoneal laparoscopic adrenalectomy and also provide a review of the alternative methods that have been described. aRole of laparoscopic adrenalectomy controversial. bRemove if primary controllable or if symptomatic. Unilateral laparoscopic adrenalectomy is the treatment of choice for patients with Cushing's syndrome due to unilateral adrenal adenomas. After an initial controversy, laparoscopic adrenalectomy for pheochromocytoma is now well accepted as a standard indication for unilateral or bilateral disease. The quintessential objective during laparoscopic adrenalectomy is early control of the adrenal vein, and in this regard, pheochromocytomas are best suited to the transperitoneal approach.